Earlier this week, we walked you through the stridently awful Apple Pay alternative being cooked up by Walmart, CVS, Best Buy, and more. It is dumb and bad, but as a recent New York Times report indicates, it's also not going anywhere any time soon. But not because anyone necessarily wants it. It's probably helpful to do a quick overview, both because the proceedings are slightly complicated and because sometimes you can end a great dumbness just by talking about it over and over again until everyone realizes just how dumb it is. So! Let's keep talking. In this corner you have wireless payments, powered by NFC technology, championed by Apple Pay because previous versions (helloooooo Google Wallet) never took off. These are Virtuous and Good and make your life easier. In the opposite corner, you have something called CurrentC, a meaningless (on multiple levels) name given to a horrific payments system developed by a consortium of major retailers like Walmart, Best Buy, Target, and CVS. It is Greedy and Dumb and relies on QR codes, which should tell you most of what you need to know. Big corporate entities fighting! Boring, right? But here's where you come in. The band of big box brothers pushing CurrentC is known as MCX, and has been around for years now. In fact, while CurrentC won't be implemented until next year, it's been a known quantity for at least the last few months. Nobody paid it any mind, though, because there was no need to, because there are sacks of potatoes with a more compelling narrative. And then Apple Pay happened! 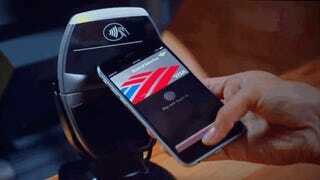 Apple Pay, which put wireless payment powers in millions and millions of phones all at once. While Google Wallet and Softcard had given plenty of Android owners mobile wallets already, it was the critical mass of iPhone 6 and 6 Pluses marching into McDonald's that caused a minor panic among the MCX multitudes. In the face of a widely adopted payment platform that would make it easier for their customers to give them money in exchange for goods and services, CVS and Rite Aid opted to pull the plug on NFC payments in their stores altogether. No more paying with your phone, at all, until CurrentC shows up sometime next year. Give CurrentC your bank account information. (No seriously). Hand the cashier the items you want to purchase. Open up your CurrentC app. Point your phone at the cashier's screen. If the QR code doesn't work, enter a numeric code by hand. Just pay with your credit card next time because honestly. It would be easier to pay for everything by counting out nickels and lining them all on the counter face-up. So why, you might wonder, would a retailer like Target or Rite Aid or any of them opt for such an anti-consumer product? To make it more difficult for people to pay, instead of easier? Because money! While CurrentC will be terrible for you—or much more likely, just another thing to ignore at the checkout counter, like Almond M&Ms or Modern Quilting magazine—it is in theory amazing for the stores behind it. Not only do they get direct access to your bank information, they get to push you towards using their own store cards, and away from the credit card companies that skim a few percentage points off of every transaction they're a part of. It's a chance for them to push "marketing communications" to you (opt-out only) and track your location (likewise). CurrentC makes at least a little more sense when you remember that it's been in the works for years, before Apple Pay was even a glimmer in a rumor site's eye. At the time, Google Wallet was languishing. 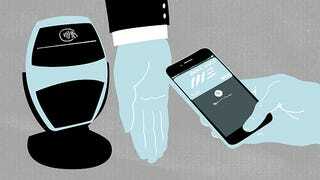 The mobile payments market was wide open. And the retailers themselves weren't yet associated with some of the biggest financial info breaches of all time. But Apple Pay is here now. As is the rightful distrust of the MCX coalition's ability to keep your info safe (in fact, it just came out that CurrentC has already been hacked). If nothing else, at this point there's been enough backlash against CurrentC that you'd think at least some of the companies involved would have turned tail by now. But last night's NY Times report indicates why they're still standing strong in the face of ugh; if they leave MCX, they'll face fines hefty enough that it's not worth just letting Apple Pay into their hearts. Not yet, anyway. In a statement released this morning, MCX denied that fines were involved for leaving MCX. But stalwart NYT reporter Mike Isaac stands by his report. And there must be at least some disincentive that would make companies like CVS suffer though such a clusternut; possibly that if you stay with MCX and use Apple Pay anyway you'll take a hit? It's murky in the way that PR scrambling always is. Either way, it's clear that this isn't a fight that MCX retailers signed up for so many years ago. And it's hard to imagine that many of them are excited to stay the course. The longer it takes for the retreat to start, though, the longer the future of payments will stay stalled out. Or you could always just shop at Walgreens instead.